Savour the enrapturing blend of herbaceous black olive, spiced frankincense and a refreshing twist of citrus with the No. 5 Exclusive Gift Set from Parks. 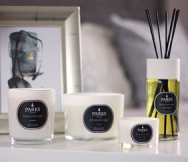 Complete with a luxury pure wax candle, hand-poured by our skilled perfumers, and an invigorating reed diffuser whose oil blend contains the finest ingredients and extracts; the No. 5 Gift Set is an exceptional gift for the fragrance lover in your life. Capable of transforming any living space with an evocative bouquet of olive, frankincense, clove and citrus, our Olive & Frankincense Candle & Diffuser Gift Set helps to create a delicate and sophisticated ambience in your home. We’ve selected a blend of fine extracts and scents to produce this captivating fragrance, pouring them into natural wax and diffuser oil to deliver powerful and long-lasting scent in any room. Bringing a symphony of woody notes to your home, our No. 5 scent is underpinned by potent notes of black olive, chosen for its inviting herbaceous and savoury fragrance. Providing a rich accompaniment is frankincense, a timeless ingredient which brings warmth and spice to the bouquet. Balancing these hefty base notes is a light twist of citrus and a pinch of clove, which serves to elevate the spicy top notes and bring depth and character to the fragrance. The result is a balanced and rounded scent, evocative of fine food, far-flung bazaars, and the warmth of a hearth loaded with smouldering timber. Wrapped up in a luxury presentation box, the No. 5 gift set makes the ideal gift for that special someone.